Representatives from Dalhousie University’s Faculty of Dentistry will be on campus on Thursday, November 16 for an admission presentation. Attendees will gain insight into the application and admission processes and student experiences at an award-winning dental school. 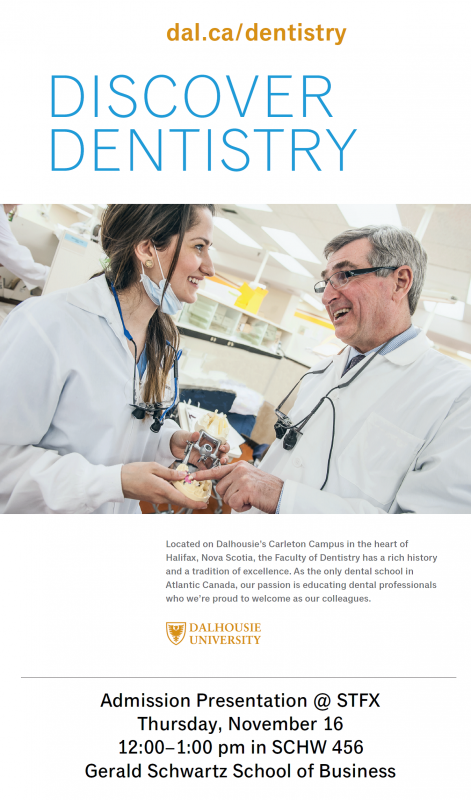 Known for its small class sizes, excellent instructor to student ratio and emphasis on clinical education and service to the community, many local oral health professionals have been educated at Dalhousie’s Faculty of Dentistry in recent years. The presentation will run from 12-1pm in the Gerald Schwartz School of Business Student Lounge (SCHW 456), with time for questions at the end.